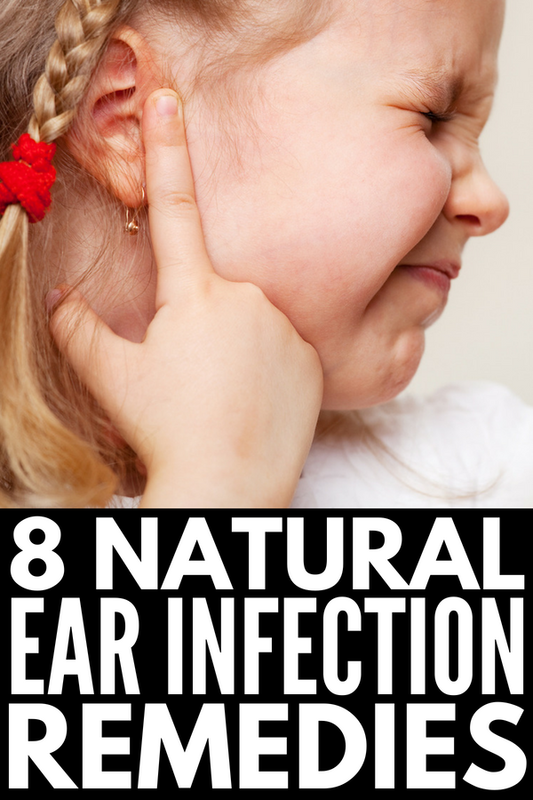 8 Natural Toddler Ear Infection Remedies to Try for Fast and Effective Relief! If you’re looking for toddler ear infection remedies, we’ve got 8 helpful ideas to bring relief to your little one, as well as our best tips and tricks to help reduce the number and severity of ear infections your child experiences each year. Of course, knowing whether your child has an ear infection in the first place can be difficult, especially if she is too young to talk and you’re not familiar with the warning signs and symptoms, so we’re taking things a step further and sharing everything you need to know about ear pain in kids. An ear infection occurs when there is a build-up of fluid in the middle ear, which causes inflammation and pain. Ear infections are more common in children than adults, and typically happen when the eustachian tube becomes swollen and inflamed due to a viral or bacterial infection. According to the National Institution of Deafness and Other Communication Disorders (NIDCD), five out of six kids will experience at least one ear infection by the age of three (SOURCE). Some children experience recurrent, or chronic, ear infections and eventually need tympanostomy tubes surgically inserted into their ear drum to help drain fluid from their middle ear. What Causes Ear Infections in Toddlers? While ear infections can happen to anyone at any age, they tend to be more frequent in younger children due to the fact that their eustachian tubes – the tubes that connect the middle ear to the back of the throat – are shorter, more horizontal, and narrower than in older kids and adults. This makes it easier for the eustachian tubes to get blocked, causing a build-up in fluid behind the ear drum, which in turn results in pressure and pain. Ear infections tend to occur at the tail end of an illness like a cold or sinus infection, and can also be caused by seasonal allergies and acid reflux. Enlarged adenoids can also interfere with the eustachian tube, causing ear infections to occur more frequently. What are the Symptoms of Ear Infections in Toddlers? Ear infections are often caused by a cold, sinus infection, and/or allergies, so if your child starts to show some of the symptoms above shortly after being sick (or after the onset of allergy season), it’s worth checking with your doctor to see if an ear infection is to blame. Change your feeding style. It has been said that breastfeeding a baby can help prevent chronic ear infections by passing along antibodies from mother to child, so the longer you breastfeed your child, the better. This can be a particularly important decision if you have a family history of ear infections. Of course, if you’re searching for toddler ear infection remedies, you’re probably already past this stage in your child’s life, but if you are still bottle feeding, remember to keep your child semi-upright to avoid fluids and germs from getting into her middle ear. Ditch the pacifier. Research suggests that kids who use pacifiers are more prone to ear infections. Not only do pacifiers introduce more germs into their mouths, but the sucking motion can force these germs into their middle ear, causing an infection. Try to ditch the pacifier before your child reaches the 6-month mark or, at the very least, limit usage to bedtime to avoid exposure to outside germs. Avoid second-hand smoke. Studies have shown that second-hand smoke can not only increase the number of ear infections a child experiences, but that it can also make the infections more severe, so avoid exposure as much as possible. Avoid large daycares. Since many viral and bacterial infections can lead to an ear infection in kids – especially those whose eustachian tubes are shorter, narrower, and more horizontal – it may be beneficial to opt for a nanny or a smaller daycare setting so your little one isn’t exposed to as many illnesses during cold and flu season. Proper hygiene. Ear infections tend to occur most often during the fall and winter months when cold and flu season is in full-swing, and exercising proper hygiene can go a long way in preventing the number of illnesses your child contracts, thus reducing the risk of chronic ear infections. Teach your child how to wash her hands properly (encourage her to sing the Happy Birthday Song while she lathers her hands to ensure she is using enough soap and washing for a sufficient amount of time), remind her not to put her fingers in her mouth, nose, and eyes, encourage her and her siblings and friends to sneeze and cough into their elbows, etc. Despite these precautions, it’s important to note that some children still experience recurrent, or chronic, ear infections and eventually need tympanostomy tubes surgically inserted into their ear drum to help drain fluid from their middle ear. It’s important to keep your child’s doctor abreast of all ear infections so a decision can be made if/when needed. I will never forget the first time my daughter had an ear infection. She was just shy of her second birthday and was just getting over a horrible head cold, and after waking up screaming from her nap, my mama gut just KNEW she had an ear infection, so off to the doctor we went. I ended up being correct, and her doctor explained to me that he prefers to wait out an ear infection for a couple of days in older kids to see if it improves on its own. He went on to explain that antibiotics don’t clear viral infections, don’t offer immediate relief from the pain associated with ear infections, and won’t help drain the fluid in the middle ear that caused the infection in the first place. With that said, he also told me that he typically errs on the side of caution and prescribes antibiotics for ear infections in kids under the age of 2 when they cannot accurately describe their symptoms as it’s difficult to gauge if the infection is getting worse or better. Most of my friends have had similar experiences in terms of ear infections and antibiotics, but it obviously depends on the prescribing doctor, and since an untreated ear infection can lead to permanent ear damage, it’s important to seek medical advice to be safe. And if you need toddler ear infection remedies to help ease ear pain in kids while you’re waiting on a doctor’s appointment and/or as you’re waiting to see if the infection will go away on its own, here are 8 home remedies for ear infection to try! Over-the-Counter Pain Relief. If your little one has fever and/or pain, one of the first toddler ear infection remedies to consider is an over-the-counter pain reliever such as Tylenol or Advil. This will help lower her temperature and keep the pain more manageable. Salt Sock. If you’re looking for natural toddler ear infection remedies, this is a great one to try. Simply fill a large white cotton sock with about 1 ½ cups of coarse sea salt, tie a knot to keep the salt in place, and warm in a skillet. Make sure it isn’t too hot to the touch, and then hold over the infected ear for immediate pain relief. You can repeat this several times throughout the day, and some like to add a couple of drops of essential oils like lavender oil, tea tree oil, or eucalyptus oil for their anti-viral, anti-bacterial, and/or anti-inflammatory properties. If you do choose to use essential oils, be careful to only apply a small amount to the sock, and never (ever) put essential oils inside your child’s ears. Warm Compresses. A great way to relieve ear pain in kids is to apply warm compresses overtop of the affected ear for 10 minutes or so throughout the day. I learned this trick from a flight attendant while flying with a horrible head cold, and can confirm it really does help relieve ear pressure when you’re in need of immediate relief. Hydrogen Peroxide. I’m not a huge fan of putting anything inside my daughter’s ears unless directed to do so by her doctor, but when I reached out to my mom friends for toddler ear infection remedies, I was surprised to hear how many of them swear by hydrogen peroxide. If you’re looking for home remedies for ear infection and your doctor feels this is a safe option, lie your little one on her side so her infected ear is facing the ceiling, drop enough hydrogen peroxide into her ear to fill her ear cavity (I suggest using a dropper for this) and then keep her in that position for about 5 minutes before allowing the liquid to drain from her ear. Dry her ear with a cotton ball and repeat a few times a day for best results. Apple Cider Vinegar. When asking my mom friends for natural ear infection remedies for toddlers, another favorite was to drop a little apple cider vinegar into the infected ear and keep it in place with a little cotton wool for 5 minutes or so, and then allow any excess liquid to drain out of the ear before drying the ear completely. I can’t say I’m overly surprised that ACV made it to the top of the list of my crew’s natural toddler ear infection remedies as it seems to be the answer to all of life’s dilemma’s these days (LOL), but be careful to consult with your child’s doctor before giving this remedy a try. Essential Oils. Essential oils have been used therapeutically for thousands of years to ward off illnesses, improve immunity, promote proper digestion, and alleviate pain, and a post about natural toddler ear infection remedies wouldn’t be complete without a list of essential oils to consider. The calming effects of lavender oil combined with its ability to soothe pain and improve respiratory issues makes this the oil of choice for may parents. Eucalyptus oil is another favorite as its anti-inflammatory properties can help reduce inflammation in the eustachian tubes while also helping to alleviate congestion. Tea tree oil is another option to consider due to its anti-viral, anti-bacterial, and anti-inflammatory properties. Whichever oil(s) you choose to use, remember to use a carrier oil such as coconut oil or grape seed oil before applying to the skin, and to never use them inside your child’s ear. For more about essential oil use, read THIS POST. Extra Pillows. Ear infections tend to be more painful while lying down, so if your little one is having problems sleeping, try propping her up on a pillow (or two) for naps and at night to make her feel more comfortable. Of course, loose bedding such as blankets and pillows should be avoided in babies and young children due to the risk of SIDS, so use your best judgement. Increase Fluids. Chewing and swallowing can help open the eustachian tubes, which will subsequently allow excess fluid from the middle ear to drain, and while your child’s appetite may be diminished if she’s feeling under the weather, encouraging her to drink more fluids and offering her popsicles can help. I hope this collection of toddler ear infection remedies helps provide your little one relief when she needs it most. Always consult with a doctor to confirm an ear infection when you suspect one, and don’t ignore symptoms that worsen over time. If you found this collection of toddler ear infection remedies helpful, please share this post on Pinterest! And if you’re looking for more parenting tips and tricks, please follow our Parenting board where we share all kinds of fabulous ideas we find each day.